I bought a bunch of fresh ginger and organic lemons so that I could make a yummy honey lemon ginger tincture of sorts. However, I learned that the oil on the lemon peel was bothering my nursing babe, so I peeled them off. While I was chopping up ginger, I thought how nice it would be to have some dried, chopped ginger along with the lemon peels for teas. Chop a couple pounds of fresh, organic ginger into small pieces. Place in a dehydrator for about 24-48 hours on about 120. Using the peels from 4-6 organic lemons, cut into small strips, or smaller pieces. Place these on another rack of the dehydrator. The smell from the dehydrator is wonderfully refreshing! With 1 full root of ginger and 4 sliced lemons, I put them in a quart jar with 2 cups of raw honey. I smashed the lemon slices in the jar until it seemed most the juice was out. Putting a lid on the concoction, I left it in the fridge. 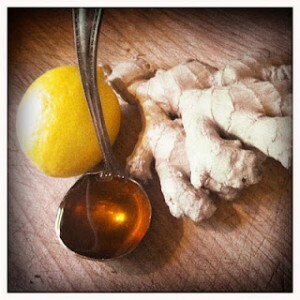 Now when I am making some tea, I can scoop out some of the delicious lemon, spicy ginger honey into my cup. Or just eat it straight out of the jar! Lemon, honey and ginger are excellent immune stimulators with anti-microbial properties. Here’s to a healthy finish for the winter!